Poems prove to be instrumental for students to learn English. 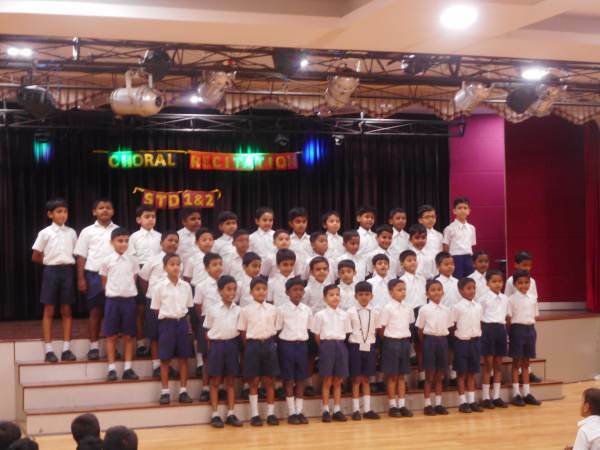 With this thought in mind, Choral Recitation Competition was organized for the students of Std. 1 and 2 on March 18, 2019 in the Bianchi Hall. All the students in every class took part in the recitation and they participated with great enthusiasm in this team event. The class teachers painstakingly trained the students to recite the poem keeping in mind their facial expression, voice modulation, diction and intonation at the time of delivery. Our eminent judges Mrs. Neeta Faigh, Ms. Claudine D’Souza and Mrs. Lilly D’Souza enjoyed the competition and praised everyone for the well conducted competition. Std. 1 B and Std. 2 D were declared winners. “The competition was tough and showed that the teachers took a lot of efforts in training the students.”, said Ms. Neeta Faigh, judge. Ms. Griselda Fernandes, our Head Teacher gave away the certificates to the winning teams.